By Peter Verheyen, © 2004. Version of article published in the Guild of Book Workers Journal, Vol. XL, No. 1, 2005 - Download original article. During his introduction, Richard Baker 1 described how, while Deputy Head of the Conservation Bindery of the Johns Hopkins University Library, he was introduced to the springback binding by John Dean 2. The manual Dean referred to, and which still has the best description of the technique is Alexander Vaughan’s Modern Bookbinding, which in Section II, Stationery Binding provides step-by-step instructions for the springback. The book has recently been reprinted and is readily available. The historical development of the springback, originally patented in Great Britain in 1799 by John and Joseph Williams 3, is described in Bernard Middleton's History of English Craft Bookbinding, but it does not detail the steps required to complete a binding. The springback also has a long history in the German binding tradition, where it continues to see regular use, especially for guestbooks. As a style, the springback is firmly rooted in the 'trade' binding tradition. The springback's robustness, and ability to lie flat and open for extended periods of time without stressing the spine unduly make the structure ideal for use as account and record books. These same qualities also make it suitable for guestbooks, lectern Bibles, and similarly used books. Regrettably the structure has not seen much use on fine bindings or in contemporary book art, especially as the structure would be a suitable platform for many elements of design bindings. Its thick boards would provide a canvas for more sculptural or inset designs. With some minor modification it could also serve as a means of presenting pop-up constructions. In the trade, this spring could be made of molded heavy cardboard or even metal. Originally covered in leather with elaborate lacing (very well described in Vaughan), it was also covered in heavy duck or canvas. What follows are the steps required to complete a springback as demonstrated by Baker. To make the endsheet signatures for the springback cut four folded sheets slightly larger than the trim size. Next, place two folded sheets fold-to-fold on the bench with a 1mm gap. 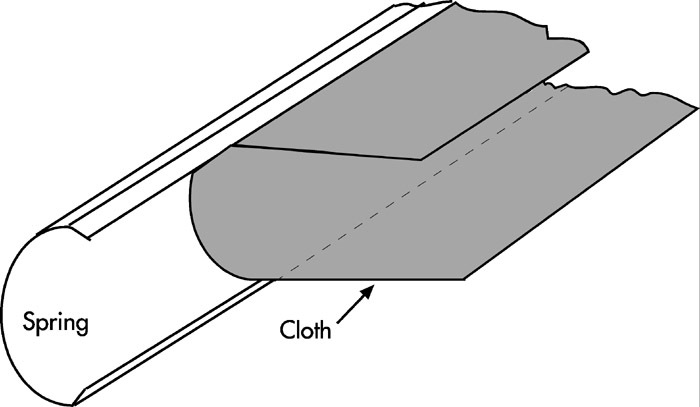 A strip of cloth approximately three inches wide is glued and placed centered over the gap on the folded sheets. This cloth is the beginning of the lever that will work against the spring. Next, glue decorated paper sheets to the folios leaving a narrow strip of the cloth visible. Place in press between boards to dry. Repeat for other endsheet. When dry, fold so that the decorated paper and cloth hinge are on the inside, and trim to text size. Vaughan [pg. 107] recommends “strengthening” the endsheets by gluing a strip of linen to the outside of the endsheets. This will not be visible later on because the plain flyleaf and first text leaf will be glued together. 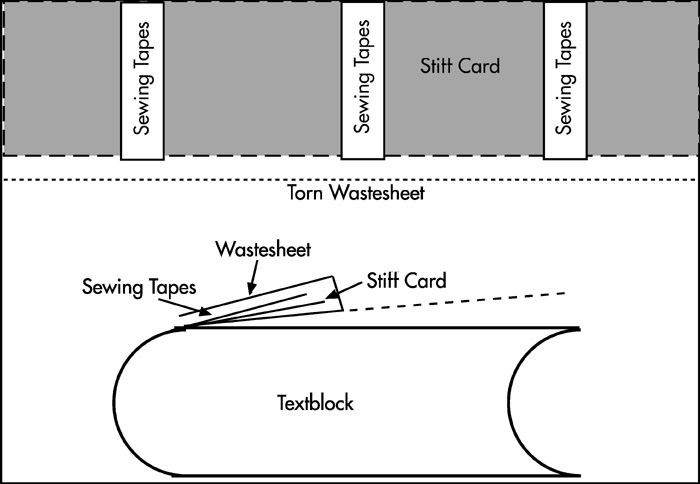 Mark up for sewing on four tapes and, using a jig, pre-punch holes. The tapes should be the width of the spine plus half the width of the text. Endsheets should be sewn using colored thread to match (or contrast) the cloth joint. After the first signature tie on plain thread until the last signature when one switches back to the colored thread. All knots go on the outside of the spine. After sewing, glue up the spine. The adhesive should be applied evenly and rubbed with a folder to ensure that the signatures are well adhered to each other. This step is highly critical, and if done improperly will cause the binding to fail! When set, glue out the first text leaf and put down the plain flyleaf. Repeat on other side and nip in press. This step increases the strength and bond between the endleaves and the text. As account books were meant to be written in across the gutter, it also “hides” the first leaf, and ensures that one starts on the first full two page spread. Trim the edges on three sides in a guillotine and round the spine. As the springback is not backed, the round tends to be more pronounced to absorb the swell created by the thread. Ideally the operations of gluing up the spine, and trimming the text should occur in quick succession, so that the text can be rounded before the glue gets too hard, making rounding more difficult. If this occurs, the spine can be lightly dampened with water/alcohol to soften prior to rounding. When dry, glue a stiff card (folder stock) to the waste sheet lining up the edge of the card with the spine of the book. Card should be 20pt, cut to the height of the text by a ¼ of the width of the text. 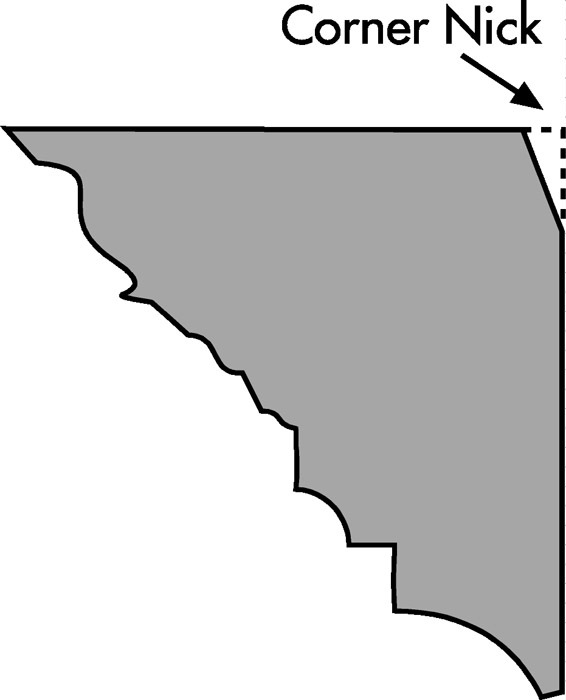 For increased stiffness, the grain direction of the card can run perpendicular to the spine, a rare occurrence in binding. Next, glue the tapes onto the card, glue out the remainder of the waste sheet and fold over to spine edge. Rub down well and cut or tear off the excess, 1 cm from the edge of the stiff card. Spine linings are made of leather strips the same color as the covering leather. Leather should be cut the length and width of the spine and one of the cards. Edge-pare the leather lightly along the edges. Paste the leather, centered on the spine, and extending on to the stiffened card flaps, applying additional paste to the outside to act as a lubricant for the folder during rubbing down. Let dry completely between boards making sure the book is in its proper shape. If needed, trim off leather flush with the ends of the books. Next, cut the stiffened flaps on an angle at the ends and edge-pare all three edges with a paring knife. Make semi-circular cut with knife through the knife at each end of the stiffened flap, being careful not to cut through the sewing. 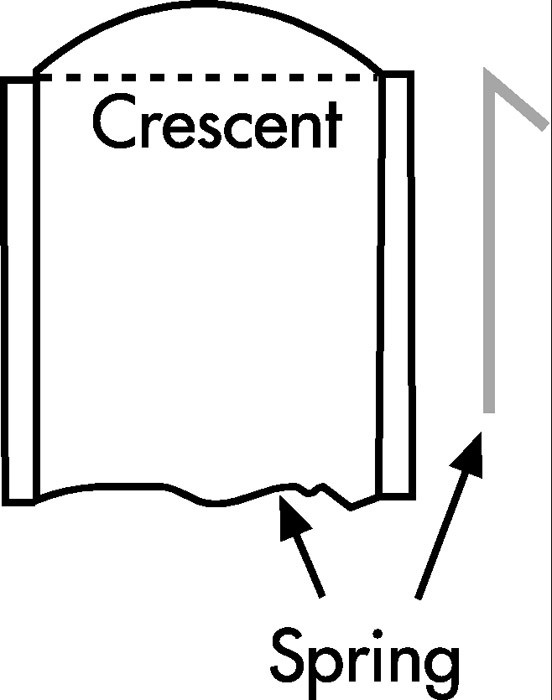 DO NOT cut straight through, but angle the blade so that the cut allows the end of the flap to move toward the book and the center of the flap moves away. The springback binding style makes use of split boards. These are made up of a binders board and 20pt card stock with are glued together on 2/3’s of the width, with the 1/3 along the spine left unglued. This is so that the flaps can later be inserted into the board. The spring is the part which gives this binding its name and which sets it apart from all other bindings styles. To make the spring, cut a strip of 20pt card stock to the length of the book plus 5cm by the width of the spine plus 1 ~1.5cm. For larger books, this can be increased. Cut a strip of 80lb text weight paper to the same length and twice the width of the card stock plus 2cm. Glue out the paper with PVA, center on the card stock, glue out again, wipe excess glue from edges, fold paper over and nip in press. While still damp, roll the spring around a piece of pipe or dowel the same diameter (or slightly smaller) than the thickness of the book at the foredge using a piece of kraft paper to wrap it tightly around the tube. The overlap should be on the inside of the spring for aesthetic reasons. Let dry for approximately 15-20 minutes, and remove. Bend the edges into a “C” shape so that the spring “grips” the spine of the book. If the spring is too loose or too tight, make a new spring as the book will not function otherwise. Hold the spring in shape with bricks until dry. To attach the spring to the text block, adhere a strip of robust bookcloth ("C" cloth or linen work well) to the inside of the spring. The length of this strip is approximately 2/3's the height by the width of the spine plus 10cm." (Attach the spring to the spine by sliding it in place and gluing the C cloth flaps to the "levers." Cut boards to size and round the foredge corners. 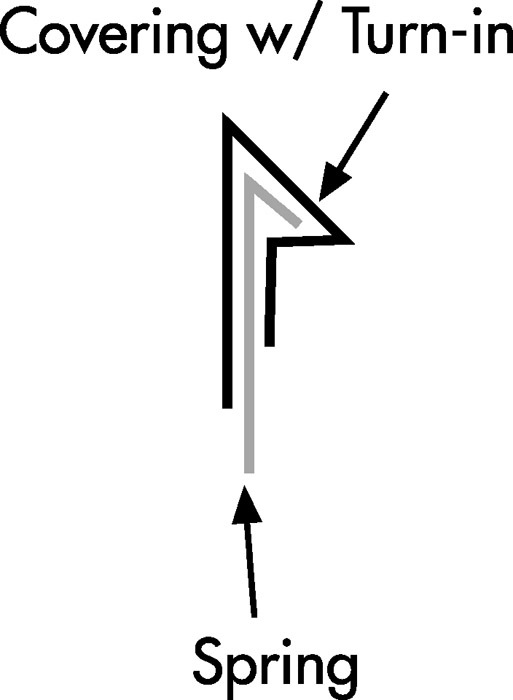 As the boards for this style tend to be thicker, the squares should be sized accordingly. The groove between the edge of the spring and the board should equal at least the twice the thickness of the board to accommodate the covering leather. If applying bands, the groove will need to be wider, otherwise the boards will jam and the book will not open properly. Mark the groove with a pencil. Nick the corners of the boards by the spine lightly. Apply glue to the inside of the split in the board and insert only the center part of the flap up to the pencil marks. Leave the groove at least as wide as the boards are thick; extra for banded work), insert a “fence” of card stock slightly larger than the boards and nip in the press. Cut the ends of the spring so that they are slightly rounded (like a crescent moon). With a paring knife, edge pare them slightly, and hammer over to form headcaps. Add leather strips to create false raised bands, if desired. Cut and edge-pare the leather for the spine and corners. Springbacks were subjected to very heavy use and the leather was edge-pared only to retain maximum strength. Paste out the leather for the corners first, and apply. 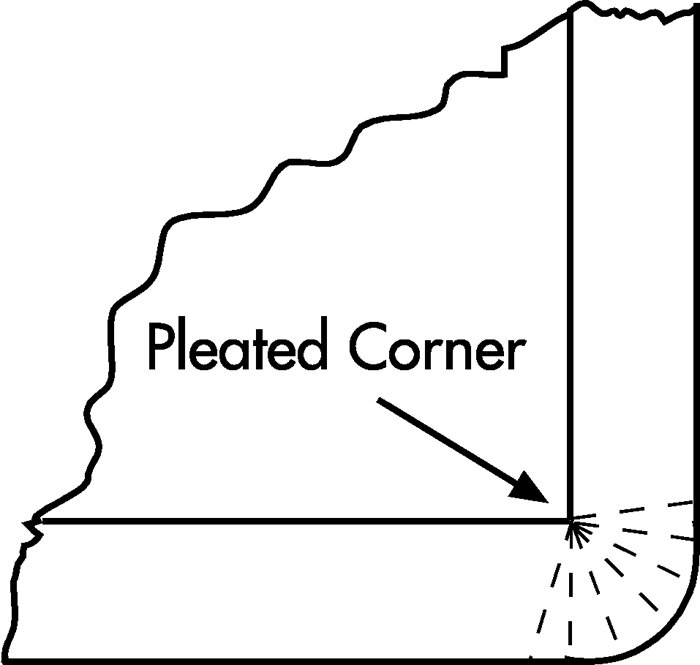 As the corners are proportionately rounded, pleated turn-ins work best. Next, lightly dampen the ends of the spring. Paste out the leather and spine, also brushing paste into the groove. Apply the spine leather and turn in at the head and tail. Place brass or plexi rods, wooden dowels or knitting needles of the appropriate thickness into the groove and press for 10-15 minutes to secure the leather. Remove from the press and tie a cord around the groove to aid in forming the head caps. Hammer over the head caps, and form so that leather takes on a 45° as in the quarter leather library style. 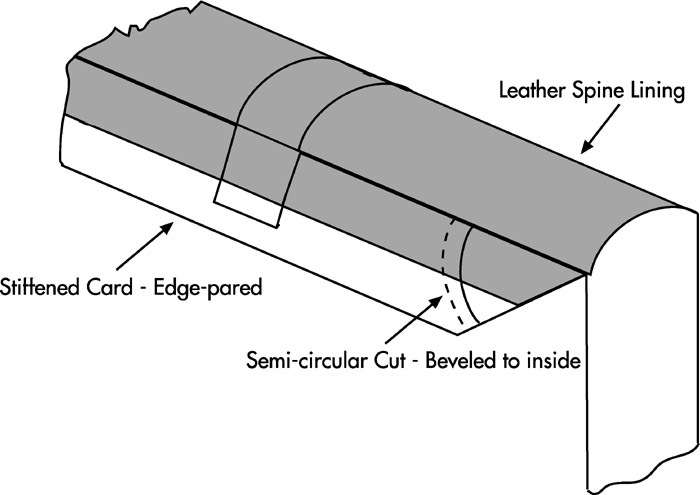 If making a full leather binding, edge-pare and paste out the leather, apply and turn in. Insert rods or dowels into the groove, and put in press for 10-15 minutes. Form the headcaps so that the leather takes on a 45° angle as in the quarter leather library style. Let dry between boards and under a weight. Trim-out and fill-in covers with appropriate thickness of material. Prepare the paper or cloth for sides and apply. Open the covers, glue down the tabs from the stiffened flap, insert fences and put in press. Next trim out insides of the covers and fill-in as appropriate. Finally put down the endsheets, insert fences and press. 2: John Dean began binding at the age of fifteen as an apprentice in Manchester, England, and worked his way through the trade and became head of the conservation bindery at the Manchester Research Library before emigrating to the U.S. where he led the bindery at the Newberry Library in Chicago. He established the Conservation Program at Johns Hopkins, which at that time also had a certified 5 year apprenticeship program based on that of the City and Guilds of London Institute. Until his retirement in 2003, Dean was Director of the Department of Conservation and Preservation at Cornell University and he continues to work at Cornell as Conservation Librarian. It was as a work-study student in the Conservation Program at Johns Hopkins that the author was introduced to and encouraged to pursue a career in conservation and the book arts. 3: Middleton, Bernard C. (1996) A History of English Craft Bookbinding, New Castle, DE: Oak Knoll Press, pp. 114-116.